For those interested in investigating further, here are more details of what is on the cover of this compilation . I am certain there will be many more copies of this in several Govt. Offices. British rule came to this area ( the Doab - between 2 rivers ) in 1803 . L I B R A R Y , G H A Z I P U R.
The name Meerut , properly spelled Merath or Mirath, is variously derived. According to one account it was originally known as Mahi Rashtra, the name given to it by one Mahi, a distinguished architect, who built a palace at Indraprashta or Dehli, in exchange for which he received the land on which Meerut now stands from the king Yudhishthira. This Mahi is said to have built the Andar Kot, a high brick fortress , the remains of which are still (1904) traceable . The Jats on the other hand, allege that Meerut was founded by a colony of their cast belonging to the Maharastra Gotra. Others say that Meerut received its name from Mahipal, king of Dehli. Still another derivation is to be found in the tradition that the place was in very ancient times called Mahidant-ka-khere . None of those provide a very satisfactory explanation for the name; but that Meerut was inhabited in very ancient times is evident from the fact that the Ashoka pillar that now stands on the ridge at Delhi was erected by the Great Buddhist Emperor in the 3rd century before Christ. This fact is attested by the inscription on the pillar, which states that the monument was removed from Meerut to Dehli by Firoz Shah in 1206 A.D. 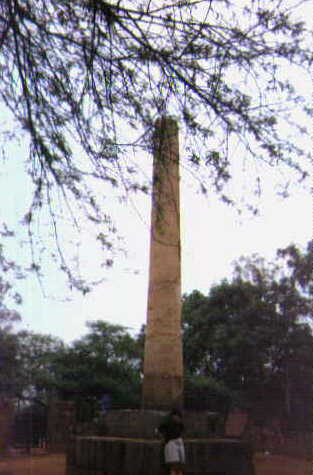 The existence of this pillar and the discovery of Buddhist remains within the city leave little room for doubt that Meerut was an important centre of Buddhism in the time of Ashoka , although no mention of the place is made by Chinese travelers , which possibly points to its decay at an early date. At a later period Meerut was captured by Saiyid Salar Masaud in his invasion of Hindostan .In the eleventh Century Hardatta , the Dor ruler of Baran or Bulandshahr , Koil and Meerut built a fort which , according to Taj-ul-Maasir of Hasan Nizami, was one " of the celebrated forts of the country of Hindustan, for the strength of its foundation and superstructure and its ditch which was broad as the ocean and fathomless". (This is why a lot of sensible people stay away from History ). This fort was captured by Qutb-ud-din in 1191 AD and all the Hindu temples were converted into mosques. In 1327 AD the Mughal chieftain Tarmsharin Khan , made an unsuccessful attack on the city, but it was completely sacked and destroyed by Timur in 1399 AD. Several centuries later , in 1788, the fort was taken by the Mahrattas after a severe struggle with the Musalman Garrison under Ghulam Qadir. The place was of sufficient importance in Akbar's day to be a mint for copper coins . Mr. Guthrie , writing in 1805 , says :" Meerut is a ruinous, depopulated town and a place of no trade . The average net market dues for four years amount to only Rs. 2,535." ( This is around 1900 , now through imaginative taxation it is 1000's of crores per year - excise etc. You must be joking little is used, that too sporadically , for the town's improvement ) It soon however began to recover . The cantonment was first established in 1806 , and in 1808 the cavalry and infantry barracks were commenced by a Major Penson . The remaining history of the city will be found in the account of the district. There is a village called "Balani" in Meerut District. It is said that here was the Ashram of Balmiki where Sita stayed after getting disposed by Lord Ram. It is same place where Love-Kush was born and Sita submerged into Earth. There is another village named as 'Gangol' just 7km away from Meerut on Meerut- Delhi road. It has a pond and an ancient temple. It is said to be the place of Vishvamitra Yaga Bhumi. It now has a big Milk cooperative dairy plant and supplies milk in the district with the trade mark 'Parag'. There is an ancient Shiv temple in the City just at the back of Sadar Police Station. It is called as 'ValleshwerNath Mandir'. It is said to be the place of worship of Mandodari, daughter of Maydanava and later wife of Ravana. Meerut was city of Maydanava due to which it original name was also said to be 'Maya rastra'. Near Meerut is the temple called 'Pura Mahadev' at Bagpat Road. The 'Shiv Linga' in this temple, is said to be placed by Loard Parushrama. Meerut is situated in between 'Indraprastha' (Delhi) and 'Hastinapur'. It has various places related to Mahabharat time.To get to Hastinapur take the Mawana Road from Meerut. There is a village named ' Birnava' which is said to be place where a 'Lakshaghaha' was bult by Duryodhan to kill all Panadvas. There is also a kasba called 'Parikshat Garh' which was developed by King Parikshat grand son of Pandava. It also has the Gandahari Talab. Mr Sharma also mentioned that Hastinapur which is just about 30km from Meerut is of importance to both Jains and Hindus. This pillar of Ashoka ( C 263-232 B.C) brought by Firoz Shah Tughluq from the neighborhood of Meerut, was set up by him in his "Hunting Palace" called Kushak-i-Shikar in AD 1365.The contemporary historians describe the complicated transport of this pillar from its original site to DELHI by the river. It broke into 5 pieces in an explosion during Farruk Siyar's reign(A.D.1713-1719 ) . And its inscribed portions were later sawed off and sent to the Asiatic Society of Bengal, Calcutta. In 1866 they were received back and all the broken pieces were joined together and the restored pillar was again put up here in 1867. The Pillar now measures 10M in Height. Did you know that there is a discussion on about whether Asoka actually built the pillars ? Here is someone who says that Ashoka made his inscriptions on already existing pillars. These pillars he says are the long lost altars of Alexander the Great (13 of them ). That seems unlikely as Alexander is known to have stayed on this side of the Indus for only a few months. The pillars are made of stone from Chunar and are found at great distances from the Indus. The other side of the coin is that the inscriptions on the pillar do look like scribbling ( the face is not even plained like for the edicts ). Not only that it seems Firoz Shah ( only 16 centuries later ) may have known that these pillars may have been shifted from their original site along the Beas, and thought nothing of shifting them again, another one in Delhi near the Firoz Shah Kotla grounds comes from Topra ( where is / was Topra ? ). See this selection of ANCIENT INDIA Books at Amazon.